I bought a lip balm making kit for my daughter from Sweet Cecily’s a little while ago, and promptly forgot about it until the other day when we were looking for something fun and a little bit different to do together. It proved to be the perfect choice, combining my girl’s love of making things and her desire to be a real ‘girly girl’ with her own lip balm, just like her mum! It’s been a while since I wrote about a skincare company and Sweet Cecily’s is exactly the kind of brand I like. A small company based here in Yorkshire, creating hand-made skin care with natural ingredients and complete with pretty packaging, there is a lot to like. I look forward to trying out more of their range in the future. The Sea Buckthorn Berry hand cream looks particularly good for us gardeners! 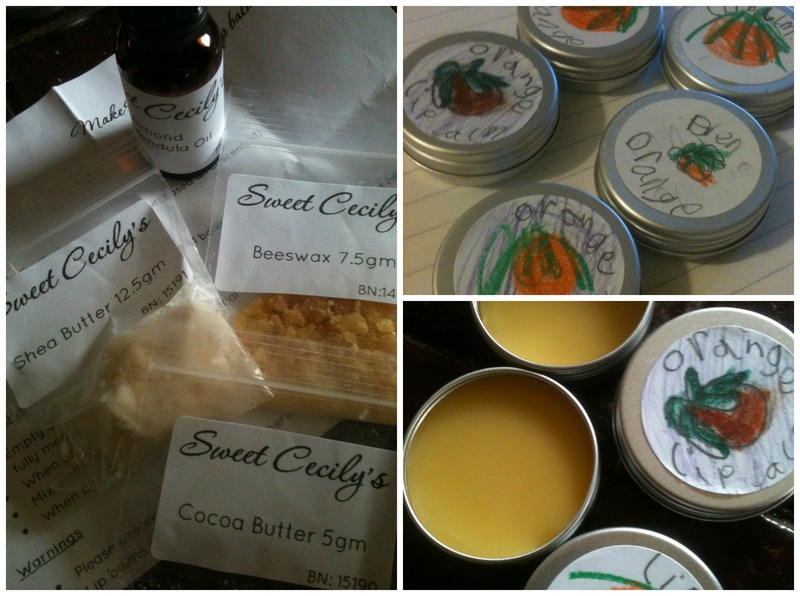 The kit I bought contained all the weighed-out ingredients for five pots of orange essential oil lip balm and the little pots, lid stickers and instructions needed, all inside a cotton drawstring bag. My daughter added all the ingredients to a double-boiler saucepan for me to heat up. Everything melted easily together and there was the perfect amount for the five tins included. I then poured the melted lip balm into the little pots and left it to cool. It took hardly any time at all and so as an activity, it wouldn’t have been enough on its own. But – plenty of time was needed for creating five mini masterpieces to decorate the lids and so Eve was happily drawing oranges all afternoon! Originally, the plan was for Eve to give out several pots away to friends, but in true diva fashion, she has decided to stockpile it all for herself. I have been honoured to receive a pot of my own to keep though, so I’m happy enough. The lip balm contains a lovely combination of shea butter, cocoa butter and almond and calendula oil and so is really moisturising and the orange essential oil adds a lovely fragrance. My pot is made all the more special because of the unique picture that has been drawn for the lid, which makes me smile every time I see it. I keep it in my bag and use it every day. I really recommend this kit as a gift, it’s been a great success. “Diva fashion” hmm what made you use that expression?